I’d like to start the article with a prologue if you don’t mind. Recently my friend asked me to hang out, but I had to take care of my Magento first, edit the products list and add some new items. I promised it won’t take long, but to my surprise it took me till the midnight to get the job done. Whoa! That’s the twist I haven’t seen coming. The thing you need to know – I’m a fresh Magento store owner and I can’t afford hiring staff at this point. I spent 6 hours just editing the assortment, and it’s a ton of time while being the one and only employee. So, the research began. By the end of the next day, I’d learned everything a human can learn about Magento. I went with the solution that seemed the most obvious to me. And I’m happy to share my experience with you, fellow store owners! The solution I came up with is not actually an invention of mine. Luckily, someone has actually figured it out before. I’m talking about the Magento extensions. I did not just solve my original problem but took steps to prevent the most unwanted ones. Here’s my Top 3 list of the time-saving extensions I now can’t imagine my life without. Remember the problem I’ve encountered at the beginning of the article? Managing assortment took me twice more time than I expected. The standard settings are straightforward and minimalistic, but dealing with a big store will eventually become your pain and will put you in misery. 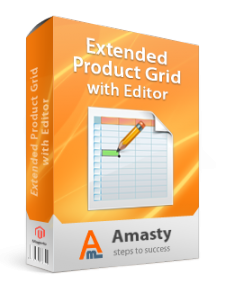 What you need is to configure Magento product grid according to your current tasks. This is the kind of problem you hope and believe won’t ever happen to you, but when it does, the scale of the tragedy is often indescribable. We insure our houses, cars, lives, but fail to recognize the necessity when it comes to our online property. I don’t want to lose the amount of time and energy I’ve put into the store management, and with the extension backing up every change I make I feel pretty safe. I strongly recommend you, my fellow Magento store owners, to install such an extension and sleep well. This extension I consider one of the most multifunctional. I find useful being able to review admin actions history. It’s easier and faster for me to look for the recent changes in Actions Log, than remembering what I’ve already done. The actual appreciation came to me when the extension reported suspicious login attempts. Somebody was trying to pick up the admin password! I panicked at first, but five deep breaths later I calmed down – the settings suggest there are 3 attempts to fill in the right password, otherwise the user will be banned. Spy software and e-commerce robots have the power to harm any internet store, including yours, so, keep that in mind. And now back to the extension – it also has a feature I haven’t tested yet but intend to when I’ll expand my staff. You can grant an admin login to every employee, for example. It’s much convenient than having one master login and 10 users online at the same time from different computers. Actions Log shows who and when did the changes, so chances of confusion are much lower. I’ve done a research and found out that using Magento editable grid saves up to 65% of the time I spent on store’s management. My store is immune from hackers and “industrial espionage”, I’m protected from the loss of data, and it’ll take 3 clicks to restore my online shop from backup. So, with a little help from my friends – extensions – I feel secure and I’m prudent about my business. Are you? Well I always prefer “Cloud Backup” for ever online work I do or whether its offline so it could ensure my backup is secure.